CUEVA NEGRA was already present in the landscape a million years ago. The rock walls of Cueva Negra are biocalcarenite formed by consolidation of sea-bed sand containing fragments of coral and sea-shells, all compressed together and cemented by calcium carbonate to form solid rock strata. The Miocene sedimentary biocalcarenite rock, in which later on the cave was formed, was laid down in the bed of the vast Tethys Sea that joined the Atlantic to the Indian Ocean. More specifically, the biocalcarenite at Cueva Negra was laid down 11.5-7 Ma which corresponds to what is known as the Tortonian period within the 12-5.3 Ma Upper Miocene. After 5.3 Ma, during the Pliocene epoch, those rock strata gradually became dry land as the Tethys Sea receded and ranges of hills rose up such that by the onset of the Pleistocene epoch, 2.6 Ma, they had more or less come to define the coastline of the Mediterranean Sea as we know it (its nearest shore-line today lies 70 km S of Cueva Negra). 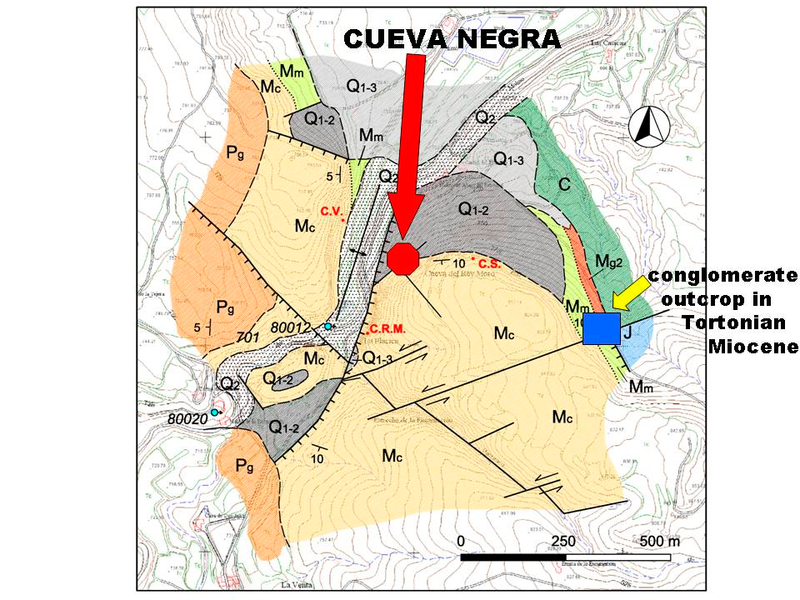 CUEVA NEGRA in its geological context (courtesy of Dr. Tomás Rodríguez-Estrella, Cartagena Polytechnic University). C.R.M. = Cave of the Moorish King (Cueva del Rey Moro); C.S. = “northern caves” (cuevas septentrionales); C.C. = Cow Cave (Cueva de las Vacas). Q2 = Holocene alluvial sediments along the course of the Río Quípar; Q1-3 = Quaternary fluviolacustrine terraces and gravels; Q1-2 = Quaternary piedmont glacis or gravel spreads; P = Upper Pliocene conglomerates, sands and clays; Mc = Upper Miocene (Tortonian) calcarenite; Mm = Upper Miocene (Tortonian) sandy marls; C = Cretaceous marls and marly limestone; J = Jurassic limestone and dolomite. 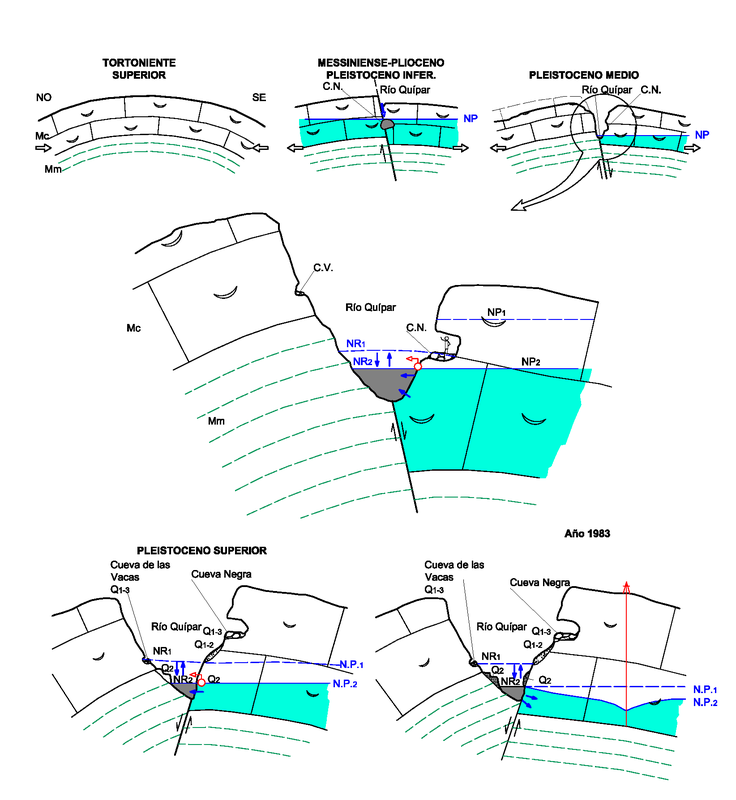 ←→ shear fault (especially, the major N-S Quípar Fault in front of Cueva Negra); ▬↨▬ anticline; ├ 10 strike and dip. How Cueva Negra came into being (after Dr. Tomás Rodríguez-Estrella). CUEVA NEGRA was formed by karst erosion of biocalcarenite strata, which probably began when they lay beneath an Upper Pliocene or initial Early Pleistocene lake on a land surface that had only just risen above sea-level. Even today a very important aquifer lies close to the land surface. Other nearby karst rock-shelters include the Cave of the Moorish King (Cueva del Rey Moro) and the “northern caves” (cuevas septentrionales). Later on, wind action and subaerial erosive processes created several taphone-type rock-shelters, especially on the opposite flank of the river (e.g. Cow Cave = Cueva de las Vacas), though they also affected the karst rock-shelters themselves. TOP LEFT Hypothetical geological cross-section (NW-SE) of Upper Miocene (Tortonian) sedimentary strata beneath the Tethys Sea, ca. 7 Ma, (Spanish NO noroeste = English northwest NW). TOP CENTRE Upper Pliocene-initial Early Pleistocene land-surface with lake and underlying aquifer (green) are affected by shear faulting (Quípar Fault) along which cavities begin to form by phreatic karst (endokarst) erosion below the water table, ca. 3.5 Ma..
TOP RIGHT Continuing uplift of the Early Pleistocene land-surface begins to drain the lake and lifts Cueva Negra (CN) above the water table, ca. 2 Ma. MIDDLE Late Early Pleistocene relation of Cueva Negra to the lake or swamp of the River Quípar; wind and subaerial erosive processes begin to affect exposed cliffs (e.g. Cueva de las Vacas or Cow Cave), ca. 1 Ma. BOTTOM LEFT Continuing Middle and Upper Pleistocene uplift diminish lakes and swamps in front of Cueva Negra, ca. 0,2 Ma. The late Early Pleistocene sedimentary accumulation inside Cueva Negra was deposited by intermittent fluviatile invasion under conditions of low-energy transport, probably from a backwater of a lake or swamp beside the cave mouth when the water level rose, perhaps seasonally or following rainstorms. 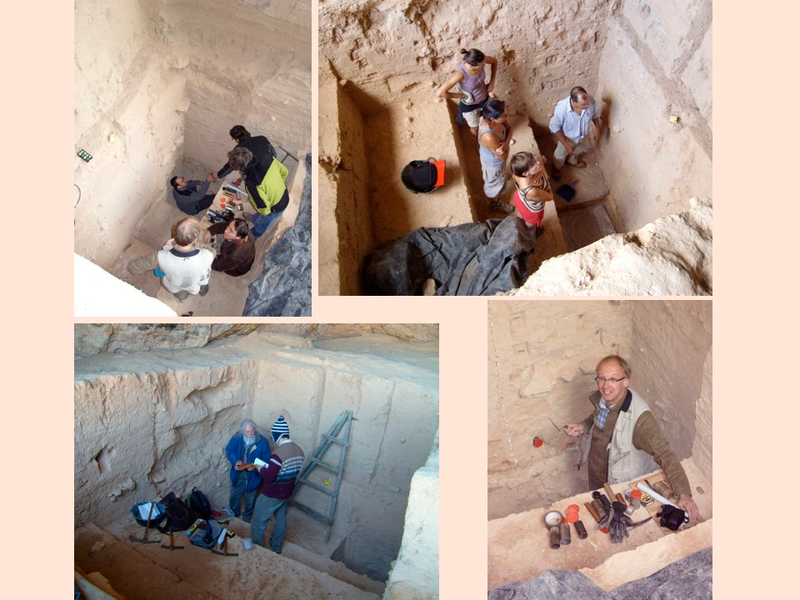 Several scientists have studied the sediments, and some are pictured below: TOP RIGHT Dr Régis Braucher (cosmogenic nuclide analysis, CEREGÉ, CNRS Aix-en-Provence) and Dr Yanni Gunnell (sediment granulometry, Université de Lyon-2); TOP RIGHT Dr Diego Angelucci (sediment micromorphology, Università di Trento): BOTTOM LEFT (Drs Gary Scott and Lluis Gibert, magnetostratigraphy, Berkeley Geochronology Center; BOTTOM RIGHT Dr Jean-Luc Shwenninger (optically stimulated sediment luminescence, Oxford University). Dr Scott determined that the entire 5-m depth of sediment belongs to the Matuyama magnetochron, which means it was laid down before 0.78 Ma when Matuyama reverse polarity gave way to Brunhes normal polarity, and nowadays widely regarded as being when the Early Pleistocene ended and the Middle Pleistocene began. Fossil rodents in the sediments belong to the same extinct species as those found at well-dated Western European sites of 1.1-0.7 Ma. Dr Schwenninger’s OSL estimates indicate that the sediments are older than 0.5 Ma. These findings demanded total rejection of the hypothesis we proposed when we began to excavate the cave, namely, that its sedimentary fill was unlikely to be older than 0.2 Ma (later Middle Pleistocene) and could well have been younger than 0.13 (early Late Pleistocene).